Jamie Houston has made herself at home on the Rainbow Wahine's front line this year. There's an unofficial Mission Control on the Stan Sheriff Center sidelines during Hawaii women's volleyball matches. "Houston, they have a problem." Jamie Houston, who touches 10 feet, 4 1/2 inches, can -- and does -- create problems for opponents. The athletic 6-foot-2 outside hitter has an explosive jump with an arm-swing to match. By volleyball standards, she's still a raw talent. The plan had been to bring Houston along slowly as the two-time Alabama player of the year made the conversion from middle blocker to left-side hitter. The injury gods had other plans for Hawaii at the start of the year. With hitters Tara Hittle and Sarah Mason out with ankle injuries, Houston was thrown into the fire against No. 1 Nebraska and No. 5 Penn State the first two matches of the season at the AVCA/NACWAA Showcase in Omaha. She was also thrown a curve. After training a few weeks on the left, Houston found herself switching to the right for a couple of games. "I just went out and played as hard as I could." Houston ended up starting seven matches early while Hittle and Mason recuperated, including the Sept. 2 rematch with Penn State in Honolulu. Playing in front of her mother who had made the trip from the mainland, the freshman put down a career-high 23 kills in the 3-2 loss to the Nittany Lions. More recently, she's returned to the role Shoji originally intended, that of a reserve. She has responded, soaring above blocks for booming kills, usually in Game 3 where the Wahine have been able to close out their last eight matches with a sweep. "She's playing a critical role for us off the bench," Shoji said. "We were forced to use her early and we weren't quite sure what she was ready to do. "I see tons of potential in her. She's still learning the game, but she's got a lot of physical ability. There's some work to be done on her arm-swing but the plan is for her to play full-time next year, and play front and back. She has the skills, she just needs the reps. She has the athleticism to do what we want her to do." Although playing part-time, Houston is second in kill average (3.08 kpg) and fifth in kills (163). That she is wearing a Wahine uniform is "a miracle," according to Shoji. It is not often he has been able to get a player who might be "geographically challenged" by the distance from home. Luring Houston away from her close-knit family was also a challenge. She is the baby girl and "it's hard not having her around," said mother Deborah Holt, who now lives in Florida. "We talk every day and there's a lot of phone tag with the time difference. "For me, letting her go was like pulling teeth. She was my last child at home and for her to leave ... but I wanted her to have a real good experience. A lot people can go play at places like Florida or Kentucky. But how many people get to play at Hawaii?" Houston was sold on the Wahine during her recruiting visit last November. She was sought after by a number of schools, including Penn State -- "A little cold," she said -- Tennessee, close to where her father James lives, and Florida, 40 miles away from where her mother has moved. Houston was ready to commit during the trip that included watching Hawaii sweep Fresno State a year ago today. "I had my mind set on Hawaii," she said. "My mom was OK with it, my (club) coach (former Olympian Rose Magers-Powell) was OK with it. Getting through to my dad was the problem." Instead of signing during the early period, Houston waited until the late period in April to send in the paperwork. "While the rest of her age group was committing as juniors, Jamie was more old school, wanting to go through the whole process as a senior," said UH associate head coach Charlie Wade, who first heard of Houston through Magers-Powell. "She wasn't going to be pressured early. At one point, we thought it was going to be a long shot. "But I knew we were a front-runner, that we had established a good rapport, that we'd be a good fit for her. She wanted to go away, wanted to go to a big-time program. We knew we met her criteria." Her future teammates met her with open arms. "I knew this was it when I found out what the girls were like as a team," she said. "Even their practices, they had what I was looking for." There has been some culture shock, mostly regarding food. Houston misses her mother's barbecue, hot wings and grits with redeye gravy. There's been calls to her mother at 4 a.m. asking how to cook "comfort food" such as collard greens. Houston has even put in a request with the nearby Star Market to carry packages of instant grits. Slowly, she is making herself at home. "I think of Jamie as a little sister," said sophomore middle Kari Gregory, Houston's roommate this past road trip. "She is such a sweetheart, the kind of person you can talk to about anything. "As a volleyball player, she has so much potential. She's a great athlete. She's going to be amazing." Houston has seriously been thinking about joining the Wahine basketball team after volleyball season is done. She was a two-time all-state basketball player, scored 1,000 points for Huntville High and was invited to the McDonald's All-American game. 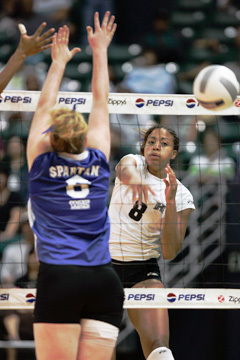 If not, she'd like to see the Wahine volleyball team challenge its basketball counterpart to a game. A number of the volleyball players also had outstanding basketball careers, including Hittle, Gregory, senior hitter Susie Boogaard and freshman hitter Jessica Keefe. There's also a matter of challenging for a national title. It was one of the goals she set for herself when signing with Hawaii last April. "I think about that all the time," she said. "One? Two? Three? "I like how this season's going. You don't want to be the best when you first start out. You want to progress and be able to get better." As far as her career, Wahine Mission Control might say, "Houston, we have liftoff."